There is only one "Mad Max" I know of, and he sent me a bubbleope of bliss the other day! This thing is so shiny and new, Topps listed all of the patents it holds to the technology involved on the back in their 'copyright' area! It is one shiny duuude! The Mystery Facts on the back show a thumbnail image of three players, next to which is a piece of trivia in which you are supposed to try and figure out who the player is. This card features M16 (Griffey Jr), M17 (Belle himself), and M18 (I have no idea, some Rockies guy: "My Three-run HR in the 11th, the first of many I'd hit in 1996, gave the Rockies their first win in their Coors Field christening."). If you can answer the question correctly, I'll send you a prize. Seriously! This is one sweet card: two of my favorite current Tribers, serial number, just the right amount of shininess. Excellent stuff!! The final card is one that Max told me he was sending. His description could not prepare me for the coolness factor of this card! That is Roberto Freakin Clemente! That is a commemorative patch for the 1963 All-Star Game. 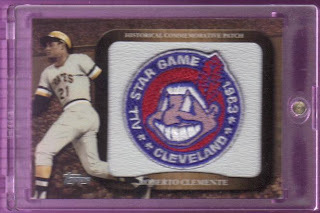 Much like a Reese's cup, separately, these are cool things, but once you get your commemorative patch in my Clemente card and your Clemente card mixed with my commemorative patch, it is pure magic! To top it off, the card came in a screw-down. Not just any old screw-down case, though. This one is MAGNETIC. I have never seen one of these and I have to say, it is a genius piece of craftsmanship - a screwdown without the screw! Someone needs to tell toy manufacturers about this one - get rid of those pesky screws we parents have to try to mind microscopic drivers for! Mad Max, THANK YOU for these great cards!! I think it's Dante Bichette that the card is looking for. Thing is, it says 1996 and the 11th. 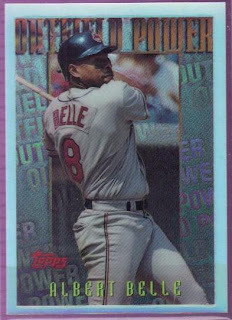 Dante hit his in the 14th in 1995, but it did win them the game in dramatic come from behnd fashion (here's the game: http://www.baseball-reference.com/boxes/COL/COL199504260.shtml). Bichette hit 40 homeruns in '95 and finished second in MVP voting actually. (Channeling my best Marisa Tomei) That'a a BS question. That is a trick question. You can't answer it. Well, Coors field opened in 1995 not 1996. The only 11 inning game played by the Rockies in 1996 was on Sept 24th but Bichette hit a solo HR. Larry Walker hit a 3 run HR on April 11th 1996 but it was in the first inning of a 9 inning game. However, If you are looking for a 3 run hr in an extra inning game in the inaugural season of Coors field...the answer is Dante Bichette on April 26th 1995 in the 14th off Remlinger before top dead center. Motherscratcher, you channeled her well, as I had her voice in my head as I read along. Well done and that deserves a BONUS prize! (It was the 'before top dead center' that really pushed it over!! hahahaha awesome! I'm really curious now...any way you can scan the back of that card? Or is it just the words or something? nevermind beckett-ed it. 96 topps mystery finest #m18 is, in fact, dante bichette. Mystery solved! Huzzah! Man, glad you found it! I would happily scan it if anyone wants to see it.